You see the photo above? Do you know what that represents? Peace. It stands for a cup of uninterrupted tea, half an hour [at least] or no arguing and the chance to have a shower, ALONE. Plasticine. My boys love modelling, making, snipping, creating – and PlayDoh has always been their only option until now, due to the previous stiffness and small-hand-hostility of the normal Plasticine I played with as a child. This has always been a disappointment to me because having three boys means that they are extremely prone to not putting lids back on where they should be – and their creations are also proudly displayed around the house for months – I mean days – on end, and the PlayDoh dries up and is useless. There’s nothing worse than semi crunchy PlayDoh. Plasticine I loved because it never dries up. Models can be presented to the world for weeks, and the substance is still good for playing with the week after the “exhibition” ends. 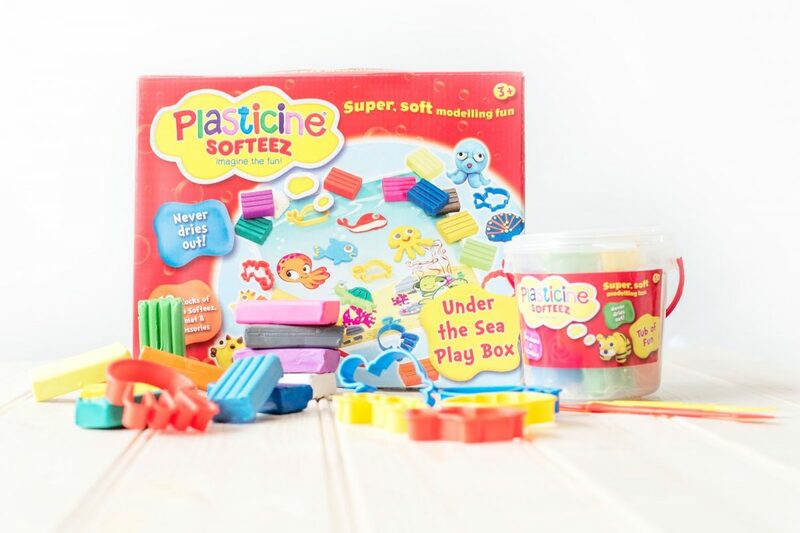 Imagine the joy of my bank balance when I discovered that Plasticine were bringing forth a Softeez Plasticine selection – for little hands! No more throwing money away – just big lumps of dark coloured plasticine everywhere. Whatever beautiful colours we begin with, they always end unmixed by Lyoto and as a big ball of something that should belong in a Fungus the Bogeyman book. Anyway, they’re happy. 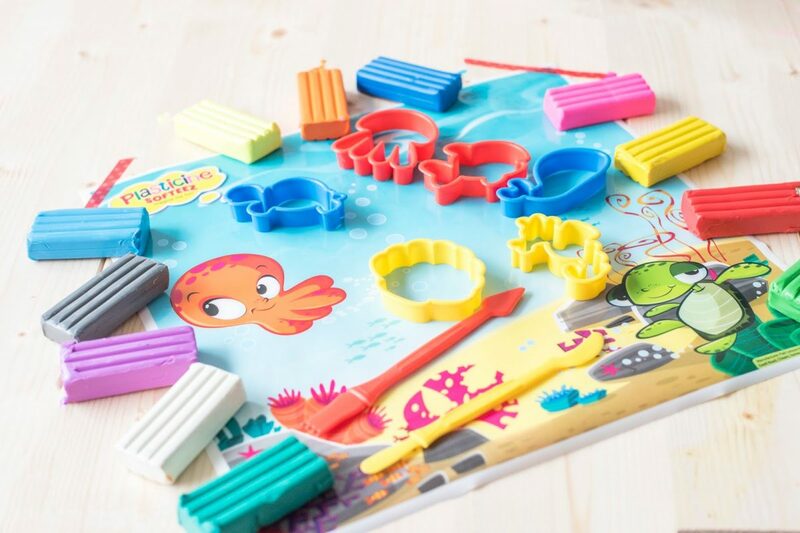 So we were sent some Plasticine Softeez kits to have fun with – and we’ve had so much fun that we’re throwing a little party next week where you too can join in to win a huge party set of your own! For now, let me show you what’s in the Softeez boxes available in shops now. There are 12 colours, cutters, a rolling tube and even a little playmate to protect your table. 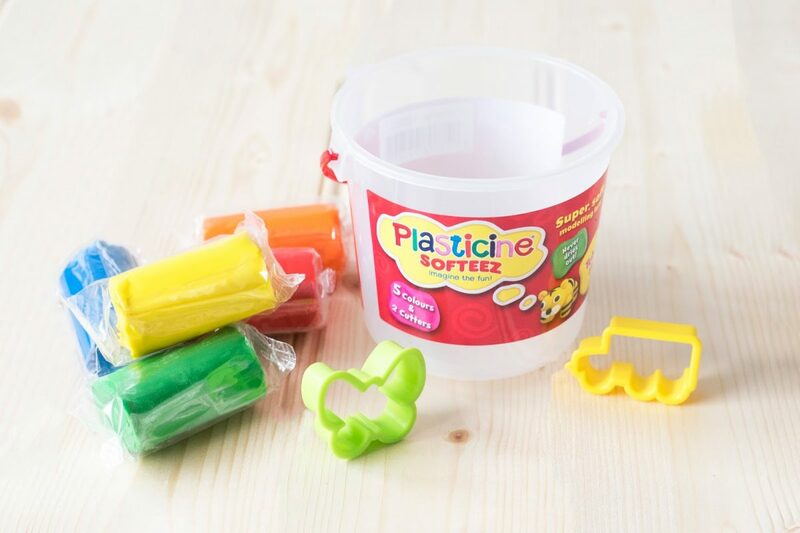 There are two little modelling tools also included in the large boxes – and in the little tubs there are five colours and two cutters. The cutters are so cute that my boys also ask for their sandwiches to be cut into those shapes [after washing]! After trialling Plasticine Softeez for a few days now, we quite love it. The boys go to it regularly to play, and love that they don’t get shouted at by me for leaving it everywhere to dry. The only criticism I have is that due to the softness of the material, it is much easier to tread into soft furnishings – and much more difficult to remove from any surface. We’ve invested in some wipes for the Plasticine box, and put a ban on it anywhere near the very plushy sofa. Still, it’s a small price to pay for peace and quiet – and it brings out the creative spirit in all of my boys. Don’t forget about our Softeez party next week – details coming soon! We were sent the Plasticine Softeez kits in return for an honest opinion.